SpaceX launched its Falcon Heavy rocket for the first time since its demonstration flight last year, and this time landed all three boosters. This was also the first time that the so-called "block V" Falcon Heavy launched, referring to the version of the side boosters compared to the demonstration flight last February. The mission launched the Arabsat-6A communications satellite owned by Arabsat, a Saudi Arabian firm, and built by Lockheed Martin. It is heading for a highly eliptical Geostationary Transfer Orbit. 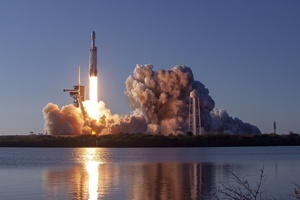 The demonstration flight of the Falcon Heavy last year was a success in that it demonstrated that the rocket could deliver its payload (a Tesla Roadster atop a platform), but the shot that received the most media attention was the synchronized landing of the two side boosters on land. It wasn't a perfect demonstration however, as the center core crashed into the sea right beside the automonous drone ship meant to be its landing pad. Last night, SpaceX nailed the landing on all three boosters: the two side boosters lansing upright at land on two landing zones, and the the center core landing on the automonous drone ship "Of course I still love you." The video quality from the Falcon Heavy from launch to landings was also noticeably better than previous launches, though the vibrations on the drone ship caused the video feed to freeze before the center core landed.